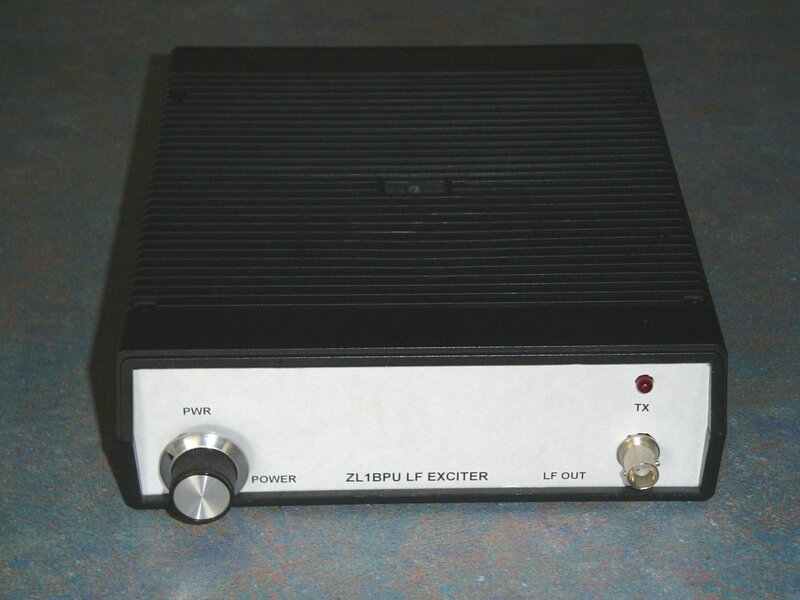 A high performance, stable, frequency agile Exciter for Amateur and LOWFER LF transmission. This little Exciter has many unique features. 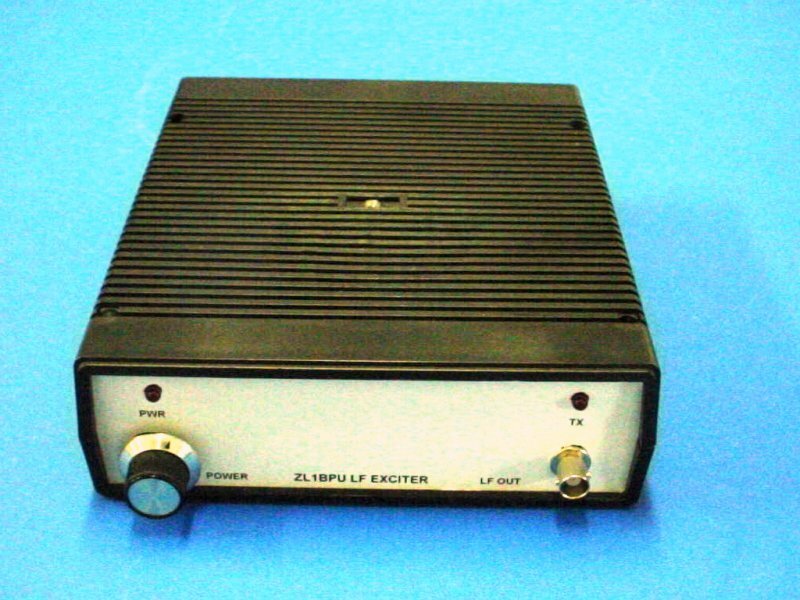 Ever wanted an LF Exciter (or a better LF Exciter?) This is a state-of-the-art unit especially for LF enthusiasts and "Lowfers", designed after consultation with highly successful LF DX experts. With very good stability and 1W sinewave output, the unit can be used as a low power transmitter, signal generator, or to drive high powered transmitters. This is also the first and only LF Exciter to include JASON mode, which it will transmit both under PC control (using I2PHD/IK2CZL JASON) or directly from the internal beacon. See example. Other LF Exciter designs have in the past have either been very complex, or lacking in the high stability and high frequency resolution that is now sought after for high performance on LF. None have included the flexible beacon features of this unit. Successful users include Lyle K0LR, Laurence KL1X, Urban SM5EUF, Dave ZL3FJ, the late Andrew ZL2BBJ, and of course World Record holders ZL6QH. The unit described here is simple to build, and can be quite small. The picture below shows the prototype, in a box 175mm wide, 210mm deep and 55mm high. The single circuit board is 140 x 90mm, so there's plenty of room inside for another board (a local control and LCD display board is planned). The design includes a linear amplifier, sine wave output and 60dB attenuator. Lyle K0LR has two even simpler versions of this design which use his well known two transistor QRP transmitter. See the barebones schematic and you will be impressed! The tiny barebones circuit board is only 50 x 90mm and is also worth a look. The same D5c firmware is used in all versions. The latest Version D6B firmware has slight hardware changes, CASTLE mode, GPS locking and 32-bit DDS operation. See the 'CASTLE' mode and Version D6 and D6B notes for more information. Complete User Manual in PDF format (2.1MB, A4 format, 41 pages). User Guide in PDF format (72kB, A4 format, 7 pages). The Exciter completed, in its enclosure. The Exciter uses a Direct Digital Synthesizer, made using a high speed microcontroller, to accurately generate radio frequency sine waves from zero to about 400 kHz. 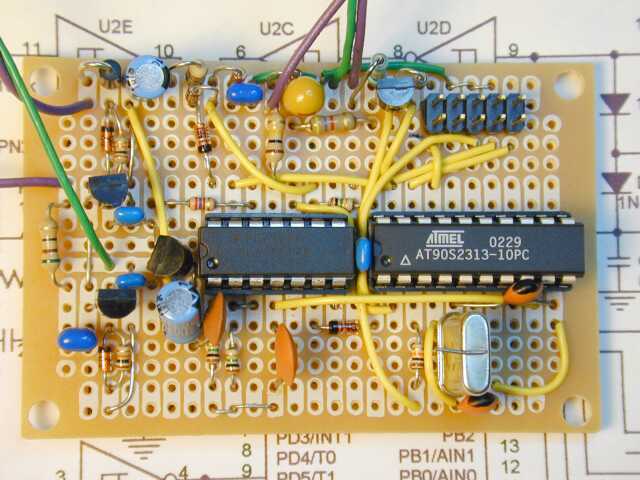 All the work is done by the inexpensive microcontroller, so no expensive DDS chip is needed. The unit will generate a CW carrier with great precision (resolution of under 1/10 Hz) and very good stability, with no drift or chirp. In addition, the Exciter firmware contains a precise digital sweep generator, for antenna testing or many other purposes. It can also be used as a signal generator. The Exciter includes a built-in beacon keyer with six popular modes. Direct Digital Synthesis, high precision and stability. Low noise (>60dB down at ±0.1Hz), and modest spurious output. Simple precise calibration procedure using a PC. Frequency resolution (step size) 0.08Hz (0.3mHz in 32-bit version). GPS synchronization of carrier (32-bit version). Three Morse modes - ASK, FSK and DFSK Morse (or ASK, CASTLE and DFSK). Two image modes - MFSK (e.g. MT-Hell) and ASK HELL. IFK and MFSK modes - for example JASON. Beacon embedded commands, changing speed, shift, frequency and mode. Simple beacon programming procedure. Message can be 120 characters long. Beacon message 'Compiler' for PC provided - interprets and downloads messages conveniently and quickly. Once programmed, the beacon will start automatically after power interruption. Beacon message can be terminated and the restart time externally synchronised. Beacon data elements can be GPS synchronized. Sweep widths to 120 kHz in 2-255 steps. Sweep step very precise, 0.085 to 6400 Hz per step. Sync output for oscilloscope triggering. Will sweep in reverse direction. Exciter is controlled and programmed from a PC or dumb terminal, with 11 user-friendly KISS commands. Command set allows full PC control in any ASK or FSK mode. Operates with I2PHD/IK2CZL JASON on PC to transmit JASON IFK. By DC front panel control from about 1uW to 1W, more than a 60dB range! (Version D5) Three programmable general purpose outputs can switch power level, antenna etc. (Version D6 and D6b) DC power level control and keying in 8 steps for E/P controlled rigs. Can generate inverted FSK signals using "negative" frequencies. Unit operates from 9-15V DC - about 25 mA key up, 125 mA key-down. The synthesizer works by calculating very precise (24 bit) steps in carrier phase at very high speed, (the sample rate is about 1.5 MHz), and then converts these accumulated phase changes to sinewave output with a Digital to Analog converter. The software is very efficient, but relies on the processor running very fast - in each sample loop there are six instructions, which take nine clock cycles to perform, so the little microcontroller with a 12.8 MHz reference is running at about 8 MIPS (8 million instructions per second)! The unit is controlled serially, from a PC or terminal. When activated, the beacon operates at a fixed rate controlled by an external 'dot clock', and message data is read sequentially from memory in the micro. Output power is generated by an audio amplifier IC with good high frequency response. It includes a DC gain control used to adjust output power. The timer used by the sweep generator to step or reset the carrier frequency (normally disabled). The external timer from the symbol (dot) clock steps the beacon to the next transmitted element or to process a command. The message (beacon script) command interpreter also operates here. The serial communications link receiver interrupt is used for manual control and programming the beacon message. The main KISS-mode command interpreter operates in this interrupt. The sweep and external timers do not of course operate at the same time. An external timer is needed for the beacon because the high operating frequency of the micro does not permit an internal hardware divided timer to operate slow enough. The flexibility of the software is such that you can change operating parameters (e.g. change frequency or mode) even while the unit is transmitting. You can also operate the Exciter remotely via a Packet Radio TNC, and even remotely change the message! There are not many parts required, and all (except the suggested amplifier) are readily obtainable. The total parts cost should be under $50. See the Parts List. Note - use an ATTiny2313-20 micro, which will also operate faster if required (the AT90S2313 is discontinued, and the new part is pin and code compatible). Once you've collected the parts, start putting it all together on a simple "spot board" - you don't need a special PCB, and layout is not critical. I recommend using sockets for all the ICs except the 5V regulator. The micro fits in a standard 0.3 in pitch 20 pin IC socket. Wire it all up as in the schematics - Schematic Part 1 and Schematic Part 2. Looking at the picture to the right, you see the circuit board with output transformer at the top. 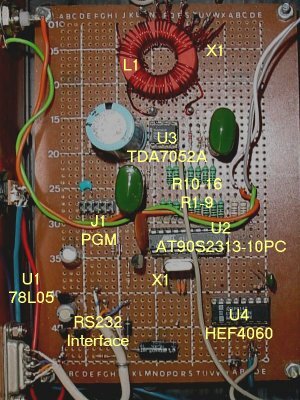 The symbol clock generator U4 is at the bottom right, with its RC timing components C15, R35, R36 above. To the left at the bottom is the simple discrete transistor RS232 interface, wired to the connector on the back panel. Just above it is the small 5V regulator U1. No heatsink is required. In the centre of the board, about one third of the way up, is the microcontroller U2. Pin 1 is to the left, so connections to the crystal X1 and the resistors that form the D-A converter (R1-9 and R10-16) are handily placed. To the left of the micro is the 2x5 pin programming header J1, made from a small piece of break-off dual pin strip. It is wired across to the micro under the board with fine insulated transformer wire. Next above is the insignificant looking but rugged power amplifier, U3. Once again, no heatsink required! U3 is flanked by the capacitors C13 (on the left) and C14 (on the right). Finally at the top is the output transformer L1. You can clearly see the twisted taps on the secondary. A short length of RG174 coax to the output socket is used to select the correct tap - simply soldered as needed. The transformer L1 is much larger than is necessary - made that way for convenience of tap changing. Note - if you can't find a TDA7052A, experiment with other inexpensive BTL audio amplifiers with good frequency response. Finally, the power busses are run under the board using tinned copper wire. The +12V DC input is at the bottom left (under the RS232 connector, and runs down from the rear panel connector halfway up on the left), and the 12V and 5V busses run up the left of the board. The 0V connection is visible at the bottom right of the board, where there's a handy link for use as a test equipment ground, and the ground buss runs up the right of the board, with branches out to each device. The secondary of the output transformer is not grounded except at the front panel. I used single sided PC board for the front and back panels. The special Exciter Control Program, shown on the right, allows the Exciter to be easily controlled, using sensible decimal numbers. This DOS program is described in the comprehensive User Manual. Using this control program is the simplest way to operate the Exciter manually, since you can enter frequencies directly (to fractions of a Hz), and also start and stop the transmitter and start and stop the beacon. The MAKEBCN software's main claim to fame is that it also "compiles" multi-mode text messages into ASK, FSK or DFSK Morse. This allows you to generate simple text files, containing words and commands, and have the MAKEBCN program compile them into "Exciter-speak", and download them automatically to the Exciter. The latest version also allows inclusion of hand-coded message segments, such as those in Sequential MT-Hell or JASON. Other manual message design techniques, and a complete list of character codings, are all described in the manual. The User Manual relates to firmware version D5b. Several newer versions have since been released. The first of these replaced FSK mode (Mode 2) with the new 'CASTLE' mode. Later versions have added GPS synchronization and GPS beacon dot clock. Version D6b - Same as Version D6, but with 32-bit synthesizer, and 0.3milliHz resolution! Upper frequency limit 350kHz with 12MHz crystal, 550kHz with 20MHz crystal (and ATTiny2313-20 micro). See the 'CASTLE' mode and Version D6 and D6B notes for more information. As with most other projects, the DDS Exciter firmware and software is available from the author for a modest charge. See the Micro Projects page for details. Just one version of firmware is required, and using user-defined parameters, will operate with most crystal frequencies from 10 to 16 MHz. Free firmware upgrades and version changes are available to existing users. Copyright © Murray Greenman 1997-2005. All rights reserved. Contact the author before using any of this material.